Best Season : Throughtout the year. Cloth required: In summer light woolen cloth and in winter heavy woolen cloth required. At an altitude of 2,730 mts. above sea level, 56 km from Srinagar. 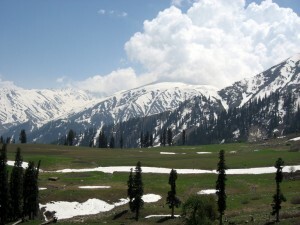 A huge cup-shaped meadow, lush and green, with slopes where the silence is broken only by the tinkle of cowbells, Gulmarg looks like a fantasy set in a film, has been the venue of several films. All around the snow-caped mountains, and on a clear day you can see all the way to Nanga Parvat is one direction and Srinagar in another. Slightly lower then Gulmarg is the shrine of Baba Reshi, a Muslim mystic saint, whose shrine is visited by people of all faiths. Gulmarg also has one of the world’s highest green Golf Courses, as well as a clubhouse, which is a historical building in its own right. For a fun-filled ride of a most unusual kind, Gulmarg’s newly constructed gondola lift from high above Gulmarg through pine-clad slopes is exhilarating. 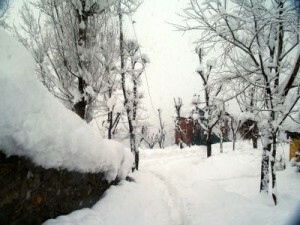 In winter, Gulmarg acquires a new persona – that of the country’s premier king resort. This entry was posted in Gulmarg, Jammu & Kashmir and tagged about gulmarg, best time to visit gulmarg, gulmarg images, gulmarg j&k, gulmarg photo, gulmarg photos, gulmarg pictures, gulmarg sightseeing, gulmarg tour, gulmarg tourism, heevan retreat gulmarg, hilltop gulmarg, honeymoon in gulmarg, jammu to gulmarg, photos of gulmarg, pictures of gulmarg, places to visit in gulmarg, srinagar gulmarg, srinagar to gulmarg. Bookmark the permalink.